I have been meaning to try this wine for quite a while now as a number of friends have mentioned how good it is. Having let it slip under my vino-dar for so long I knew it was time to jump in. After reading the blurb, you start to realise why this wine is talked up so much. A blend of Malbec, Cabernet Sauvignon and Merlot aged in oak casks for 24 months, you expect a complex, structured and succulent wine. Sounds pretty delicious so far. 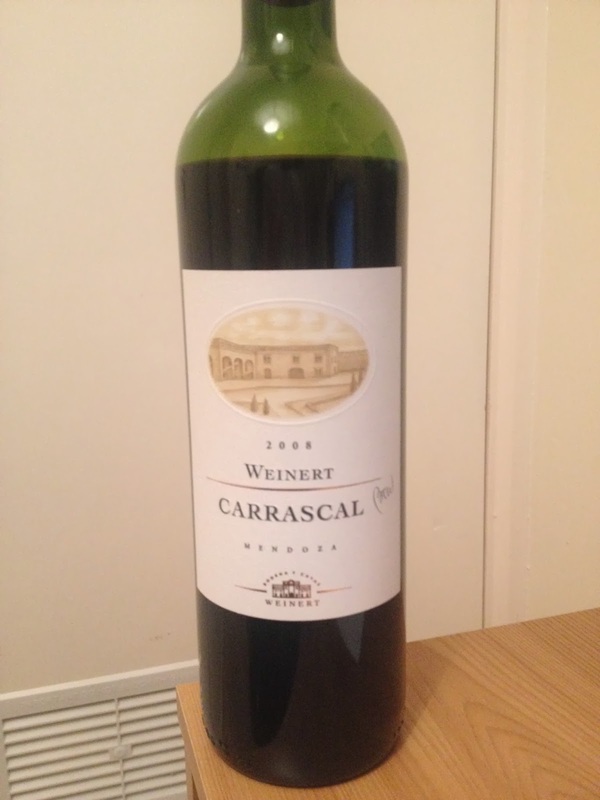 Produced in Carrascal just outside Mendoza in Argentina, this town has been famous for its wine for quite a while, having risen to fame in the 19th Century for producing clay amphora's usually seen in the arms of a Roman Goddess. In the glass, you'll see a deep ruby fading to a clear pink rim. Surprise surprise. The nose is one of dark plum, raisins, leather and just a touch of vanilla. Almost every time you put your nose towards it the flavours are coming at you, sitting down, and saying hi before making way for the next. Reminiscent of the evening I spent speed-dating on Valentine's day last week. We can safely say, however, that this is far more successful. The palate is rich and unctuous with plenty of ripe fruits and a touch of tobacco box. It then moves through licorice, nutmeg and just a dash of black pepper - a brilliant mix of savory and sweet. The tannins are polite and well-mannered, letting you know they're there, but never interrupting. Again the flavours and sensations continue to change. Going from full and slightly extrovert to start with to soft, smooth and shy once allowed to really open up in the glass. Although fantastic on its own I can't help but think this would have been even better with the game pie I'd scoffed down in a pub an hour earlier. Shame. But then again, this wine makes a fantastic centre piece for the evening and its amazing complexity shouldn't be quelled by anything else. Not for the first bottle anyway. Just when you think it can't get any better, we haven't even discussed price yet. At only £7.95 from The Wine Society (you have to join as a member to order) or £8.50 for the 2007 vintage from Tanners, this is by far the most complicated, enticing and seductive wine I have tried under £10 for a very long time. Certainly if you're looking for a New World alternative to a Bordeaux or Rioja it really doesn't get much better. Even more exciting is how good it will be in a couple more years in bottle. Staggeringly good quality and one to try! P.S. I didn't really do speed dating on Valentines day. God.